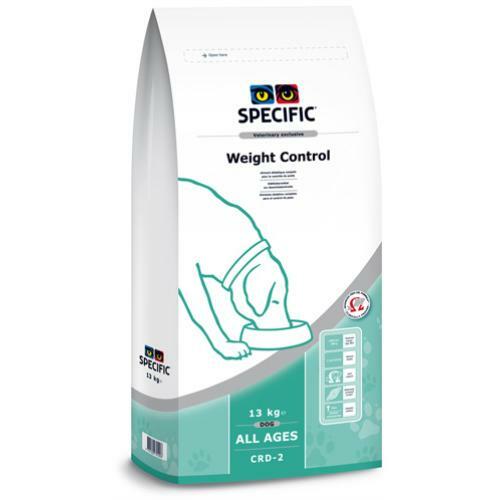 Specific CRD-2 Weight Control Dog Food is a delicious low fat kibble that's been formulated to help maintain your dog at a healthy body weight after an initial weight loss programme; this dog food is low in fat and calories with slightly raised fibre and protein content. This means you can give your dog a large tasty amount food that will satisfy their appetite whilst keeping off the extra weight. Low in calories and fat and high in fibre and protein you can serve full portions allowing your dog to control their weight without feeling hungry. High in protein so lean muscle mass is preserved. High levels of Omega-3 fish oils to help maintain healthy coat skin and joints. Wheat, fish meal, maize protein, powdered cellulose, beet pulp, hydrolysed poultry protein, eggs, rice, chicken fat, minerals, potato protein, fish oil, vitamins and trace elements, psyllium husk, methionine, L-carnitine. Antioxidants: EC approved additives: BHA, BHT, propyl gallate. It contains no artificial colours or flavourings.